Former FBI Director James Comey has finally admitted publicly that President Donald Trump has not been under investigation, after months of deliberately leaving the impression that he was. Now the issue becomes whether Trump somehow obstructed justice in trying to save one of his subordinates, a decorated military veteran who ran the Defense Intelligence Agency (DIA), from a frivolous prosecution. Trump had fired Lt. Gen. Michael T. Flynn (Ret. ), who supported him during the campaign, but couldn’t stand to see this patriot raked over the coals by the press and the Democrats for some confusing statements he made about his own Russian contacts during the period when he was preparing the new Trump administration’s foreign policy. Trump was loyal to a friend and supporter. For that, according to Comey, Trump is now in the crosshairs of Special Counsel Robert Mueller. The media agenda has to be exposed and challenged. The issue is not Trump but the FBI, whose two former directors are now tag-teaming Trump for the purpose of destroying him. They have been presented by the liberal media as beyond reproach when their own work at the FBI was disastrous and should be the subject of investigations and hearings by congressional intelligence committees. In short, Congress is investigating the wrong thing. Consider the special counsel, Robert Mueller, who gives commencement speeches about honor and integrity. This is a guy who met secretly with Islamist groups and sanitized FBI training materials so that FBI agents could not recognize and identify the enemy trying to kill us. The Judicial Watch report, “U.S. Government Purges of Law Enforcement Training Material Deemed ‘Offensive’ to Muslims,” should have disqualified Mueller from ever again serving in any role as an investigator of anything remotely connected to national security. Christopher Farrell of Judicial Watch calls it a “curious” story about how “a group of radical Islamists” with links to terrorist groups like Hamas met with Mueller, and convinced him to “scrub” and change FBI training materials on radical Islam. Mueller assembled a secret group of Islamic “experts” who read the materials and censored them. These people became the “editors” of the training materials. One of the changes, incredibly enough, involved eliminating a reference to the Islamic Koran as the “teaching of the Prophets” and replacing it with “the revealed word of God.” A reference to the Muslim Brotherhood as a terrorist organization was also deemed offensive. To make matters worse, all of this censorship occurred after Mueller’s investigation into the post 9/11 anthrax attacks was totally mishandled. Al Qaeda carried out the attacks, in conjunction with the actual 9/11 terrorist hijackings, but Mueller and his people blamed a series of American scientists. Finally, they found one they could blame, Bruce Ivins, who committed suicide following persecution by FBI agents. Ivins was dead and could not defend himself. The anthrax letters, which carried statements of “Death to America” and “Death to Israel,” were assumed to be the work of right-wingers working for U.S. government military or civilian labs. One of Mueller’s agents, Richard Lambert, later sued Mueller for botching the probe. Comey would take over for Mueller, obviously aware of the major deficiencies in the anthrax inquiry, but did not reopen the investigation to seek the truth about al-Qaeda’s role in the attacks. The flawed anthrax investigation was an example of the politically twisted investigative methodology that Mueller would officially implement, under pressure from Islamist groups such as the Council on American-Islamic Relations (CAIR), in regard to Islamic terrorism in general. As Farrell told me in an interview, Mueller has a reputation as an effective law enforcement official, but the evidence shows that he permitted political manipulation of FBI training materials regarding the Islamic threat and “completely bungled” the anthrax investigation. Regarding Mueller and Comey, Mueller’s successor as FBI director, Farrell says there is “an appearance of a deep, long professional relationship, if not a personal one.” When Mueller was FBI director, Comey was deputy attorney general. Both of them had said American scientist Steven J. Hatfill was guilty in the anthrax case though he was completely innocent. The Department of Justice eventually had to pay Hatfill over $5 million in damages after ruining his career. Farrell said the fact that Comey cleared his Senate Intelligence Committee testimony with Special Counsel Mueller suggests they have been “synchronizing the effort.” He adds, “It stinks.” Under these circumstances, it is impossible to believe that Mueller will conclude that Comey mishandled the Russian investigation and deserved to be fired by Trump. Instead, they both have enormous incentive to find Trump guilty of something. Together, they cannot permit FBI misdeeds to be exposed to public view. Only Trump can save himself now. He can fire Mueller after offering the evidence of this setup and citing evidence of Mueller’s terrible track record in investigating Islamic terrorism. 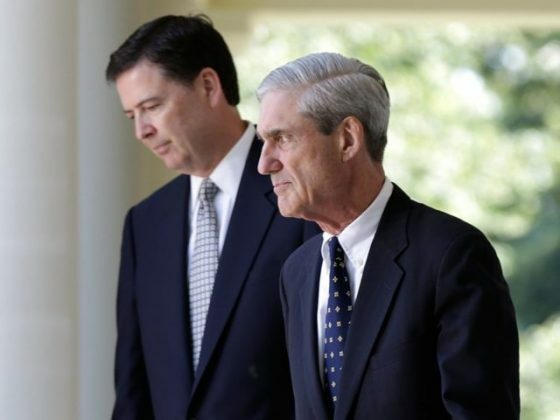 He has the evidence to show that Mueller has a conflict of interest through his friendship with Comey and cannot be trusted to arrive at the truth. Trump would take a beating from the press, but it’s the right thing to do.